One of the biggies on the to do list has been to sew some sort of “stack-pack” style sailcover. It wasn’t a convenience thing it was a serious safety thing. Take a peek at our boom, we can’t reach most of it. Not only is it very high, but with the bimini and dodger it was completely inaccessible. 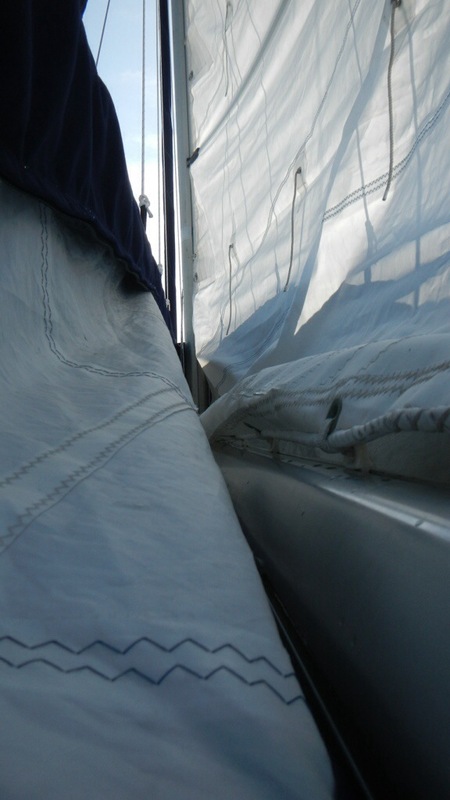 Bringing down and flaking the mainsail in the flat calm river was an ordeal, as was putting on the sailcover. Reefing at sea?-eeeek. It required balancing on the varnished (slippery) coaming and the top of the lifelines with nothing to hang onto except the bottom of the boom itself. Stupidly dangerous. So, I set about making a new sailcover with lazyjacks. It’s basically two, flat pieces of canvas. Attach it to the boom and hang it from the mast. Easy. I started with the Sailrite PDF instructions and the free full instruction video, but I wanted to make some custom changes. (If I hadn’t it really would have been easy) Namely, I wanted to use the slide slots we have in the sides of our boom as the attachment points for the bottom of the cover, line the entire sail cover with Dacron, and keep all of the weight-bearing seams away from any sun exposure. Decreasing windage was also a big priority while at the same time being mindful that we can’t even reach the boom, we really can’t reach the top of the sail cover and shove the sail in, it had to fit in the cover on its own when it’s lowered. And so began my complicated easy project. At times I got quite frustrated, like when I discovered it made a spectacular rain catcher , but I think I finally got all the kinks worked out. 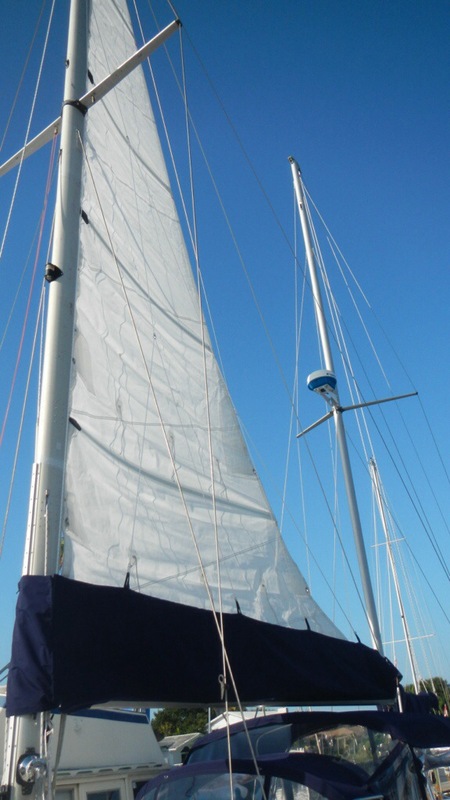 It no longer catches rain, it does catch the sail, it is fully lined to protect from chafe, none of the working seams are exposed to the sun, doesn’t interfere with reefing lines, and it looks pretty tidy too. And most importantly, no more standing above the lifelines! ^don’t judge this one-it was my pattern! I’m going to forget for a little while longer that I still have a second mast and sail to tend to. Wow, that came out great! Have you tested your reefing with it yet? 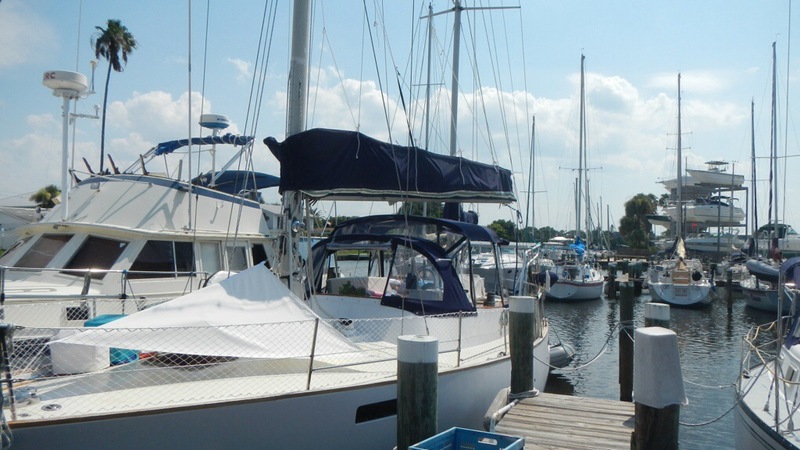 Do you have slab reefing or traditional? Does the top have a zipper or snaps to hold it shut? Sorry for all the questions. I have reefed it only in the slip-in no wind (we have slab reefing done at the mast). We reefed several times in planning the design and we will be practicing several times next time we go out. Hope everything still goes smoothly. The front panel is easily unzipped to access the cringles (I think that’s the word?) at the luff of the sail/base of the boom for reefing or just flaking it all the way down. I also raised the cover up a little around all the reefing jam cleats on the boom so that they are easily visible/reachable. 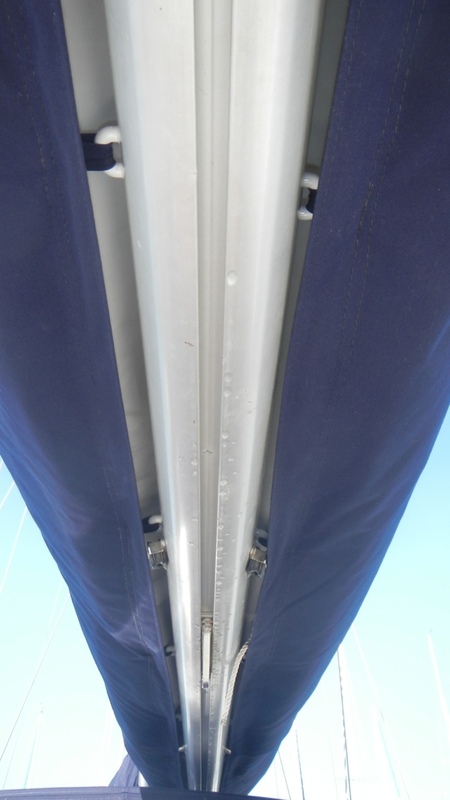 By using the sliders on the sides of the boom to attach the sailcover instead to the bottom of the sail itself, I have easy access to the sail by reaching up from underneath along the whole boom. 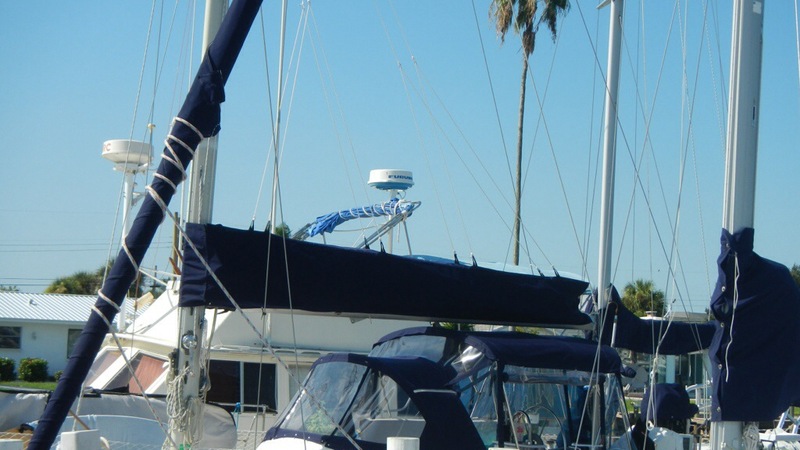 It also makes removing the sail cover easy and it can be done with the sail in place. 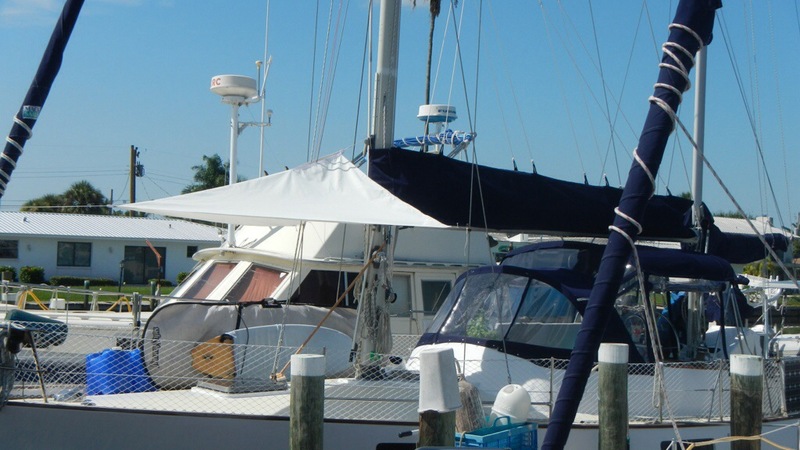 The lazy jacks can also be loosened and the sail cover rolled up and lashed neatly to the boom if we don’t want it up while sailing. The top panel has a zipper that runs from the mast past the foot. We can’t reach the zipper and so this was one of the hardest parts to figure out. Originally I planned on running a continuous line on the zipper like the mack packs but the sail kept catching it and flaking on top of it no matter how tight I kept the tension. After three days of playing with it on the pattern piece I had a very elaborate system of pulleys rigged. It worked most of the time, but a simple dog leash on the zipper was much easier, faster and more fool proof. So that’s what we went with. We just have to fling it around the lazy jacks which is still much easier than the old sail cover. Keith is better at it, but I can do it by myself. Fortunately, the zipper doesn’t have to be messed with until we are anchored or in the slip. Are you guys thinking of doing one on Smitty? Just found your blog – what a treasure house of information! You obviously did not use the “burn a hole thru the cover and wrap the lazy Jack line around the PVC pipe” approach. How is the webbing attached? The dark color makes it difficult to tell. Is it on the outside of the cover? Does it wrap around the pipe somehow? The webbing is sewn into the pocket holding the batten (PVC won’t hold its shape) it does wrap around the batten to provide support. I totally redesigned the pocket area for more strength. If you are still designing yours, let me know and I’ll send you some better pics! Yes, I am still thinking about the stack pack… and I haven’t come up with a good design yet. I got to see a new one by Ullman Sails – it had a batten pocket sewn along the inside upper corners and used solid fiberglass battens. But that was for a huge mainsail on a Sundeer. I think PVC will work just fine on our 11′ boom for our mizzen. But again, the main sticking point for me is how to make the attachment point for the jack lines – it has to be pretty substantial, and should somehow support the batten – I’d love to see how you did yours! I’d really appreciate any detail you could give me. If you want to take this to email, send to windborneinpugetsound at gmail dot com.